1) I was not able to locate the yacht transfer fee $370++ one way per person. We are booked 6-11 July so might see you there if our times overlap. Ans what happens if I, an early booker, am staying at the resort, and I blurt out to a late booker in the villa next to me "HAHAHA I'm only paying $370 return! Sucker!" and then he complains to the resort that he's being charged more for the transfer? A shared transfer on the resort's private yacht is charged at US$370 + taxes and service per person per way. This charge will be added to your total bill. Please e-mail [email protected] for more information or to arrange your transfer. OK, this is a tough question but not at all impossible to answer. The answer is both yes and no. Degree is the key word here. Beautiful new villa interiors and amenities aside, you should find good sand, but not nearly as much as say Rangali and almost certainly nowhere near as fine as Irufushi. As you can see from the picture above, the main part of Ithaafushi is built on a natural island that had a tiny, and I mean tiny, amount of greenery to begin with. Because of this you're going to find almost 100% planted (as opposed to natural) jungle with no natural undergrowth. Lots of thick undergrowth is what you really need in order for you to feel like it's real and been there for hundreds of thousands or millions of years. There will be pathways through planted rows of palm trees but with a somewhat, or rather fake feel to it all (depending on how it's done and who you ask!) 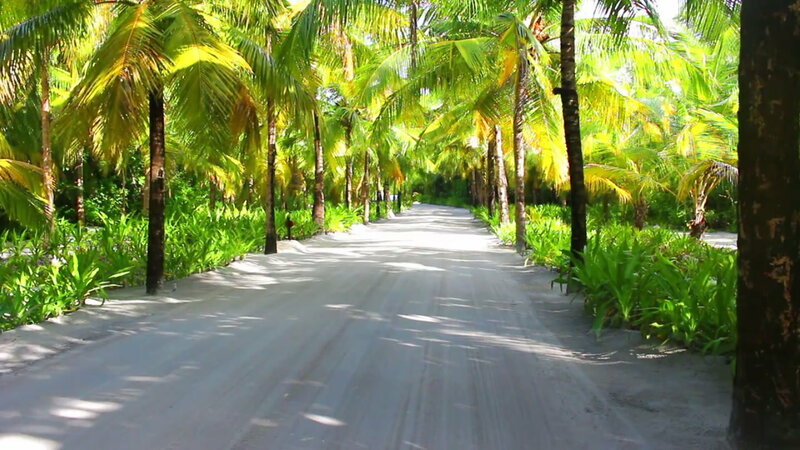 Take a look at the picture below of One&Only Reethi Rah Maldives and you'll see what I mean regarding the lack of undergrowth you can expect, the planted forest tree feel and the straight, man-made roads. Most of that resort is reclaimed land. Beautiful but a rather fake beautiful. 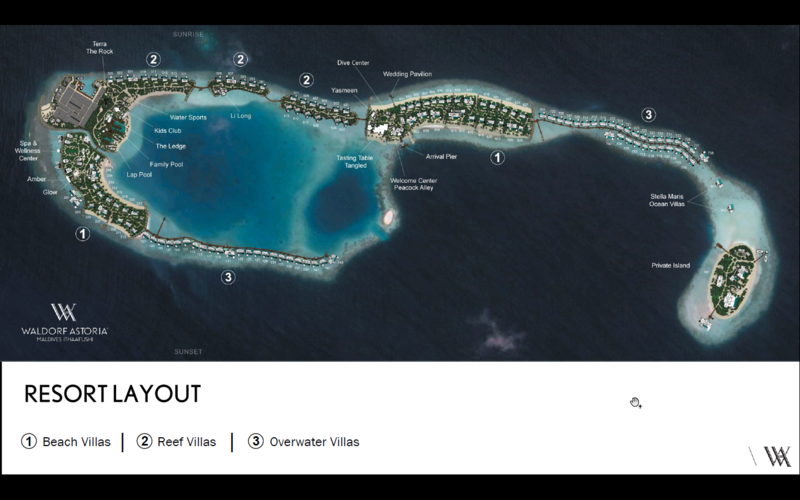 Note that I'm not saying the whole of Reethi Rah is like that but it's a good example of what developers and landscape artists do when there is nothing to work with. If you look at the layout of Ithaafushi they've been very careful not to make mistakes like the Reethi Rah, i.e; they've avoided too many perfectly straight pathways. They've tried to twist and turn them and by all means it should look much better but still, it's all planted and it will be very noticible. Then again some folks will no doubt wander down the pathways and think "Oh, so lovely!" while others who are more observant will be thinking "Hmm.....these aren't cut out of any original jungle." And there's something else to consider as well. 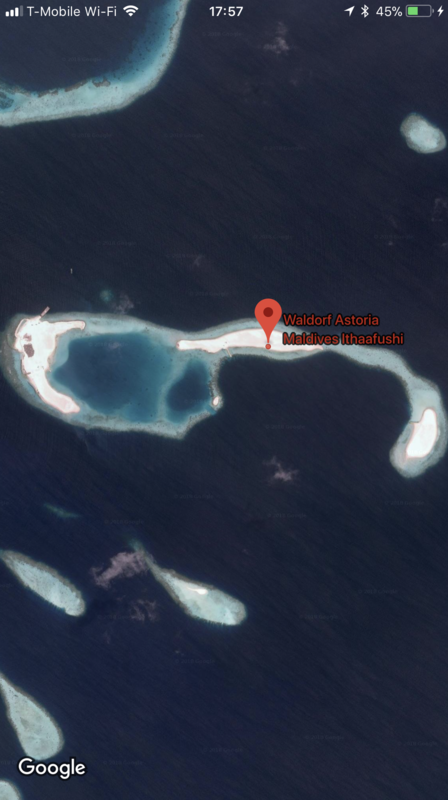 The undergrowth will get thicker as time goes by so when the resort opens it will seem barren by Rangali (Rangali Island in particular) and Irufushi standards. I'm not sure how long the undergrowth will take to thicken up but probably years. The bonus is you have the large lagoon in the centre and its shallow water and that gradation into deep blue and the fantastic array of blues and greens mixed together. You can see it's got a reasonably good-looking lagoon from the photos earlier in the thread. Beachfront will be sparse, especially at high tide, and it doesn't look like there's enough space to have a decent beach BBQ anywhere and that's a shame. If you've got the time and the inclination, get onto Google Maps or similar service and check out the sizes and widths of the beaches of some of the islands that have resorts on them. You'll soon see that this resort, although new and up-market, is pretty crowded. Some folks won't mind too much but others will. I suggest arranging the times you plan on laying about on the beach and to do it at low tide, that way you'll have more beachfront to play with. The Water Sports centre will be able to tell you the precise times. When you want to go swimming or snorkelling at the resort, you may wish to do it at high tide. That way you get more shallow water before any dropoff or where it gets deep. Another obvious advantage with Ithaafushi that I should point out is the 2 sandbanks that you see in the first picture, one in the middle of the resort (situated on the band of coral on the far right of the lagoon) and the other to the south (which the resort may have access to on a permanent basis). This is something that most resorts do not have and will be fun to take a boat out to (or swim to if you're game). They should be able to take guests there to have a picnic or whatnot - but at a price no doubt. As far as the coral and marine life is concerned, you probably know that around 70% of the coral in the Maldives was killed off by higher than normal water temperatures in 2016. It will take a good many years for the coral to recover but at a brand new resort like this I doubt there is even a single cluster of coral that survived both the rise in temperature and the construction process. Hey, that's probably an exaggeration but the good thing is there is usually a lot of marine life in situations like this because they feed off the algae that grows on dead coral. Again, because of the construction process I don't know how much marine life there is but I'd hazard a guess and say not a lot at this stage, at least not in close proximity to the BVs and the inner regions of the lagoon. Other resorts have living coral and tons of marine life so this is something to consider. Of course there will be excursions that you can go on to visit nearby 'healthy' reefs but they won't be free. Hope that's sort of answered your question. schoppy, alanslegal, hugolover and 7 others like this. You are extremely knowledgable about this part of the world, I think it's wonderful you are so passionate about these resorts. coolbeans202, pineapple_09 and Traveler Dave like this. Asked for an upgrade quote and whether they would honor their booking confirmation of $370++ RT yacht transfer. I got a response in about 24 hours. For my dates next year in January 2020. "Upgrade to King Reef Villa with Pool: US$200+ 23.2% Tax and service charge per night. Upgrade to King Grand Overwater Villa with Pool: US$400+ 23.2% Tax and service charge per night. Please accept our sincere apologies for the inconvenience, the transfer information mentioned in your booking confirmation is a technical error and our team has now rectified the issue. That being said, I am pleased to honor the rate $370+ 23.2% per person for round trip, as mentioned on your confirmation." pineapple_09, scwam and brodielayne like this. I'm gonna be there then too. I'll bring a bunch of printouts of my transfer confirmation and my bullhorn. pineapple_09 and MaldivesFreak like this. I received the exact same response when I inquired regarding the yacht transfer rate. All of you worrying about it can rectify the situation with a simple email. The technical error pricing should be closer to what they should actually charge. When I stayed at the Conrad Bora Bora in 2017 the charge was 10,560 xpf per person return. At todays exchange rate that is roughly $100, so taking in account the remoteness of the Maldives, $370++ is still a bit too high. Twice that is BS. @MaldivesFreak-Very useful info! Much appreciated. Hopefully, the trees they plant are somewhat matured with leaves at opening. pineapple_09, crombiestone, mctravel1 and 4 others like this. Good news, contacted reservation and they honoured the original $370++ return price per person ( I took a screenshot before they changed it). Aw man so the real rate is $370++ each way. Should have booked when they had the error. I was still holding out to see what if any Diamond benefits they provided. I emailed the resort and they replied confirming they will honour the $370++ round trip; I would have been contemplating cancellation if it was $370++ each way. Anyway $370++ round trip is still high in my opinion so we'll see what kind of "yacht" they provide - there better be canapes and free flow sparkling wine at the minimum - and not just a cold towel and bottled water. In regards to the 70 foot princess references in this thread, is there an actual link that states this is the one the WA will be using - I can't find any reference to its confirmation anywhere. Also, do we know if there will be a soft opening? And also, anyone can tell the difference between the Reef Villa vs Overwater Villas?